I nearly wrote off Taylor Jenkins Reid after reading her latest, the extremely acclaimed One True Loves. While the novel itself left a sour taste in my mouth, Reid's prose proved to be unforgettable. And I'm so glad I gave her another chance. Maybe in Another Life is everything I wanted One True Loves to be--and so much more. Hannah Martin is at the stage at her life, twenty-nine, when everything has fallen apart instead of come together. She's spent her life moving from city to city, unable to find a place or vocation that calls to her, and after sleeping with a married man, she slinks back to Los Angeles, her hometown, to live with her best friend, Gabby. Gabby is more family to Hannah than her own parents or ballet prodigy sister, who all reside in London, are. When her parents moved, Hannah stayed with Gabby and her family and, ever since, she's been on her own, hopping around the world without a care in the world. But Hannah wants to change. She's shaken after her affair and envious of Gabby, who lives in marital bliss with a successful career. When Gabby throws her a party to welcome her home, Hannah is faced with an important choice: stay at the party with Ethan, her high school boyfriend, and see where the future takes her? Or go home with Gabby instead of jumping into--yet again--another relationship? Every chapter alternates between two versions of Hannah's life--the first, where she goes home with Gabby, and the second, where she stays with Ethan. As a fan of the multiverse theory and a math major who is more than a little obsessed with the concept of infinity, I was skeptical if Reid could pull this off. But, what I appreciated about this novel, is that Reid leaves the science behind. In fact, she doesn't even mention it until the last chapter. Instead, this story focuses on how similar, and how different, these two versions of Hannah's life are. Many aspects to her life remain the same, regardless of the choices she makes--such as her friendship with Gabby, the support she receives from Gabby's parents, the manner in which her relationship with her own parents develop--but other, huge aspects of her life, are drastically different. For me, the strength of this novel--and the reason why you should read it--lies in the honest, emotional friendship at its core. Gabby is Hannah's rock, and vice versa. Both of their lives go through upheavals, in both versions of Hannah's life, and though the timing and circumstances change, their love for another doesn't. I'm a huge proponent of female friendships and, frankly, this was the component that was really missing for me in One True Loves. 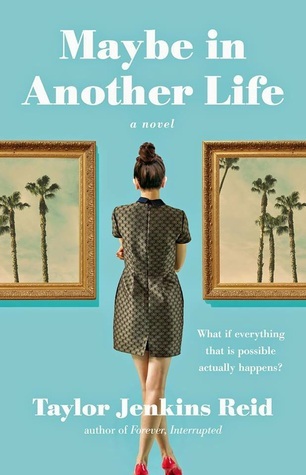 In Maybe Another Life, though, Reid not only nails this relationship, but she also perfectly captures Hannah's inner struggles and motivations. This is very much a coming of age novel and Hannah's musings and thoughts as she tries to become a person she can be proud of are inspiring and wonderful to read about. She's a solid decade older than I am, but I could relate to her completely, regardless, and I loved that timeless quality to her voice. Of course, there is a romance in this novel. I don't want to say more about it than what you already know from the synopsis, but let me say that the romances will surprise you. I think it's interesting, how the choices Hannah made affected her, physically, but also emotionally, into making her an inherently slightly different person in each version of her life. And the romances are catered to those versions of Hannah and I loved how personable and authentic they felt, in both parallel universes. Of course, I preferred one of Hannah's futures to the other, but it's honestly so hard to choose--both of these futures offer so much to her, but at a steep cost. Ultimately, this book was such a wonderful, unexpected surprise. I loved it, from beginning to end, and found myself reflecting on this story long after the pages were closed. I so rarely have such polar reactions to an author's novels but if you have yet to pick up a Reid book, start with this. It makes me want to read her entire backlog and forget about One True Loves entirely. Now the fact that she leaves the science out at the beginning would have actually turned me off. However, since she addresses it in the end, I think I can deal. :) I have to say that you also turned me from thinking... eh... to really wanting to read it. It has so many aspect that make me want to say "eh" (lack of female relationships) but your love of this book has infected me. I'm in the mood for a good romance so I may have to seek this book out. Brilly review! I have been dragging my heels with this author. I recently went on a bender but have yet to pick them up. I think started this one at one point but I didn't continue. I'm always down for strong friendships in books so I'm glad to hear this novel features a good one. I'm definitely curious about the relationships in both of her lives. It sounds like one of those what if scenario things. I'm glad to hear you really loved this one! That's great you gave the author another shot. Sometimes one book will work, while another doesn't. I am curious about this one. I love the dual lives premise - it's like the musical If/Then! Hi, Keertana! I haven’t been around since May, so I have a lot to catch up. It’s a shame really that I missed summer, when you had time to read and blog and was more active chatting about books. Oh, well… It hit me now how much I missed your posts. Not only your beautiful and thoughtful reviews, but also your monthly updates. It’s strange how though we interact only via blog I feel connected. I went straight to you monthly rewind posts and read all five of them in a row (April - August). I don’t have time right now, but I’ll return later and write my comments. I hope everything ok and you adjusted to your new life in France. As for the book, I’ve meant to read Maybe in Another Life. This book, as well as her After I Do, were highly recommended by several of my trusted bookish friends. For some reason I haven’t picked up them, but your review are so convincing. I think you gave me that final push I needed to finally read it.